WASHINGTON, D.C. – Nov. 15, 2017 – Earlier today, Voices of Youth Count, an initiative of Chapin Hall at the University of Chicago, released a first-of-its kind study on unaccompanied youth homelessness in America. The study, Missed Opportunities: Youth Homelessness in America, is the first to capture the scope of the issue broadly, by harnessing data from young people who have slept on the streets or in shelters; ran away from or were kicked out of their homes; or couch surfed, staying temporarily with friends and family. In 2008, National Network for Youth successfully advocated for the U.S. Congress to require and fund this study as part of the reauthorization of the Runaway and Homeless Youth Act. Please join us in widely disseminating the findings of this critical research and in advocating for the policy solutions needed to address this national crisis. A large share of youth included were couch surfing or otherwise staying with others while lacking a home of their own. These experiences are the most invisible. Previous research shows that couch surfing generally takes place early in people’s struggles with homelessness, with sleeping more on the streets happening at later stages of homelessness. Homelessness is just as much of a challenge in rural communities as it is in urban communities. Of course the number of youth experiencing homelessness in urban and suburban areas is much larger given population density. Half of the youth who experienced homelessness in the past year did so for the first time. This means that it is not enough to respond to the problem; we must get in front of it. This finding was supported by the in-depth interviews that Chapin Hall conducted in five sites. The majority of the youth interviewed had experiences of housing instability that started in childhood or adolescence. Young parents—especially those unmarried—had a three times higher risk of experiencing homelessness than non-parenting peers. This translates to more than 1 in 3 homeless young women who are pregnant or already have children of their own. This number is highest in rural communities. This finding is alarming, not only because of the risks posed to young people themselves, but also to their children. Homelessness in early childhood can have lifelong consequences. Nearly one third of youth experiencing homelessness had been in the child welfare system. LGBTQ youth were more than twice as likely to have experienced homelessness as their non-LGBTQ peers. Black youth were nearly twice as likely to have experienced homelessness as white peers, and Hispanic youth were 1.5 times more likely. The lack of a high school diploma or GED was the most strongly correlated with higher risk for youth homelessness. Those without these had a 3.5 times higher likelihood of experiencing homelessness than peers who completed high school. The Runaway and Homeless Youth Act program administered by HHS has an over 40 year history of prioritizing and serving these young people, but has been massively underfunded, $119 million per year is the highest amount the program has even been funded. They have a wealth of expertise and insight on how to address these challenges, but not enough resources to make a sizable difference. The fact that three-quarters of those who experienced “explicit homelessness” also experienced “hidden homelessness” shows the fluidity of homelessness experiences and the need for federal programs to be accessible to all young people experiencing homelessness. These findings should dramatically change how youth homelessness is discussed and addressed at the federal level. There are critical actions Congress can take right now that would make a significant impact. 1: The Runaway and Homeless Youth Act is set to be introduced for reauthorization. We have worked closely with Congress, service providers and advocates to craft and support this legislation that provides critical community-based care, housing and counseling to homeless youth and young adults. Congress should act swiftly to pass this legislation. 2: NN4Y secured support for the introduction of the Homeless Children and Youth Act in 2017, which would update HUD’s definition of homelessness and eliminate complex documentation necessary to be deemed homeless, to help children, youth and families receive homeless assistance. Congress should pass this Act immediately to update HUD’s outdated policies. 3. Work upstream to prevent youth homelessness and prevent chronic adult homelessness. To address youth homelessness, we need to engage and address systems that these young people go through earlier in life—foster care, schools, the criminal justice system, and more—to intervene where high-risk youth need support. Most homeless adults were first homeless before 25. If we can stop the cycle there, we can also prevent chronic adult homelessness. 4: Increase federal funding for developmentally appropriate programs targeted to young people at-risk of and experiencing homelessness through the Runaway and Homeless Youth Act programs administered by HHS and the Education for Homeless Children and Youth Act program administered by ED. “The findings in this report validate what hundreds of youth service providers and youth who have experienced homelessness across the country have been saying for decades: homelessness among youth and young adults is far more pervasive than officials recognize and occurs in rural and urban communities alike. 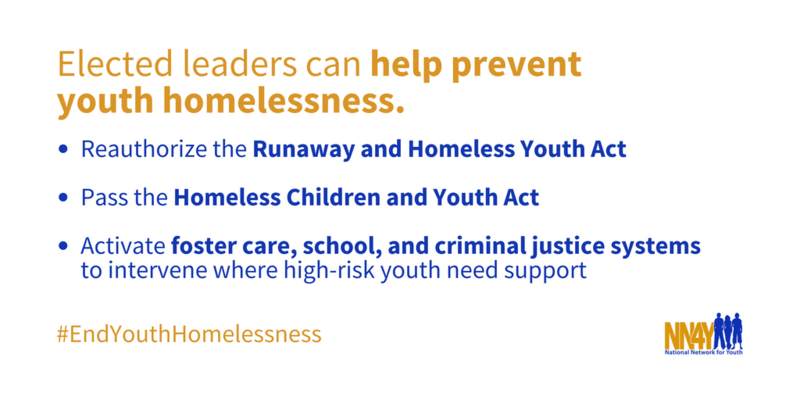 Congress must act to reauthorize and fully fund the Runaway and Homeless Youth Act, which has a 43-year record of success in providing critical community-based care, prevention services, housing and counseling to homeless youth. “The face of homelessness among young people is varied and complex. While far too many are forced to sleep on the street, there are also far too many hidden homeless youth bouncing from couch to couch, sleeping in a car or a shelter just to try to survive the night. For too long, outdated definitions and program requirements from federal agencies like HUD have restricted the services and resources available to young people experiencing these varied forms of homelessness. But there should be no quibbling on this point: young people should be able to access the services and housing they need to avoid or exit homelessness, no matter what form it takes. Children and young adults are incredibly vulnerable in those situations, and they deserve real solutions. Be sure to tag us on social media (@nn4youth) and share with us the outreach you have done. Join NN4Y for a webinar discussion with the Principal Investigator of Voices of Youth Count, Dr. Matthew Morton. More details coming soon. Voices of Youth Count is an unprecedented initiative to understand, address and prevent youth homelessness. Chapin Hall has conducted the most comprehensive research to date on youth homelessness, incorporating youth voices to develop achievable solutions. This research creates a foundation on which we can build solutions –effective policies and practices –to end homelessness for young people.